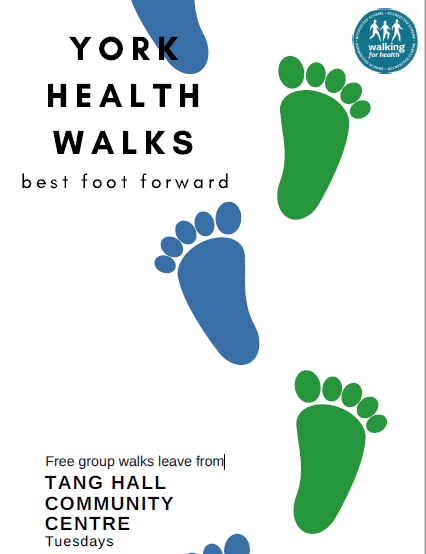 Walking for health runs short to medium (45-60 minute) walks from Tang Hall Community Centre at 10:30am on Tuesdays. Getting active can be difficult, but we’re here to help. With Walking for Health, you can take part in a free short walk nearby, to help you get active and stay active, at a pace that works for you. It’s a great way to stretch your legs, explore what’s on your doorstep and make new friends. For over 12 years, we’ve helped thousands of people like you discover the many benefits of regular group walks; from reducing stress, to losing weight, to sharing laughs – Walking for Health has something for everyone.